App Review: Submarine by Brisk Mobile Inc. 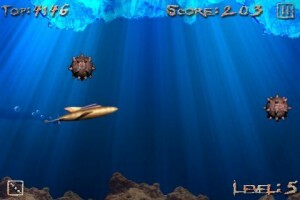 Submarine is a fast-paced underwater game. The object of the game is to steer your submarine around obstacles and through whirlpools without crashing into the rocky ocean floor or the icebergs above. Once the game starts, the submarine moves forward on its own at quite a quick clip. Your job is merely to move it vertically to avoid all of the potential pitfalls. Amongst the obstacles there are also bonuses that appear as something resembling an ice cube. When your sub touches one of these you are rewarded either with points or with a shield that will protect you against a single collision with another object (As in the first picture below it appears as a cloud of bubbles around the sub.). Otherwise, a single collision means “game over.” The good news is that you just start again at the beginning of the level that you were on. Your points do start over at zero, though. Also, the obstacles are not always in the same place each time you play a level. So, you have to stay on your toes. You can choose one of two ways to control the sub. You can use the accelerometer controls and tilt your iPhone/iPod or you can use a touch control system. 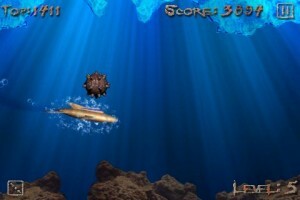 Using the touch controls, a finger on the screen pushes the submarine up towards the surface, and no fingers on the screen makes it descend towards the ocean floor. I found that using the tilt controls worked just fine for me. You can fine tune the amount of response that you get when you tilt your device in the “Options” section of the game. There are fifteen levels of game play. Each one more difficult than the one before. The first time you play the game, only level one is unlocked. As you complete each level, the next one is unlocked so that every time you play after that, you can choose the level at which you would like to start. In playing this game, I found it took a little while to get used to the controls and the speed of the submarine. It wasn’t long, though, before I was hooked; trying to beat the next level or get a higher score than last time. Submarine is not very complex to play, but the graphics are great an it is fun and addicting. Submarine is $0.99 in the iTunes App Store. This is really good game! Graphics is great! Gameplay is very interesting! Recommend all!